COMMENT & ANALYSIS: Horseback, unicycle, canoe, electric canoe and mode-mixing horse and canoe were some of the replies when we asked readers what mode of transport is best placed to reduce emissions across Ireland. We would add electric cars to that list of joke answers — and while public transport has a part to play, another mode shadows its potential nationally. If you have not guessed: the real answer is cycling — an option not taken seriously enough. When we say it’s not taken seriously enough we don’t mean the anti-cycling crowd. We mean those in the middle, including many people who cycle or those who are somewhat supportive of cycling. Redesigning our streets and roads for safe and attractive cycling (and walking) should be a no-brainer for many reasons — for more livable urban and rural areas; keeping our towns and cities moving; tackling inactivity and the massive health benefits which go with that; for the local environment and human health; and for the planet’s climate. These benefits and the potential of cycling is underestimated (more on that below). Technology saving us from climate change and other problems facing us is all too attractive. But the green credentials of electric cars and electric hybrids are questionable, for more than a few reasons. Even if there were no emission issues with mining the batteries and if our unclean power grid was cleaned up, there’s still the fact that current electric batteries are a limited resource and, so, there’s a need to use these wisely (ie for buses, car shares etc). A strong reason not to look to electric cars is value for money. The maximum subsidy for electric cars is €10,000 per car (or €7,500 per hybrid car, which still need to burn fuel). Those subsidies would be far better used against electric bicycles or family car-replacing bicycles such as cargo bicycles. If there are issues with subsiding electric cars, then it’s that you don’t get emissions benefits and you possibly encourage inactivity and congestion. If there are issues with subsidising bicycles, for example where people don’t cycle to work on a bicycle purchased using the bike-to-work scheme, then the state still gets some health benefits from more people cycling at different times. But the main investment in cycling by far has to be changing our roads and streets to make them more attractive and safer for cycling (and walking, which should be done at the same time). The above image, taken in September, is of the junction of Richmond Street and the South Circular Road in Dublin. It’s a sample of possible things to come — it’s one of the junctions where at peak times more bicycles often get past a green traffic light sequence than cars. In this case, it’s happening when the conditions on this route between Rathmines and the city centre are far from ideal. Conditions are often poor along the route with heavy traffic and, as there’s no segregation of buses and bicycles, buses have to pull into the cycle lane to get to bus stops. At night and on Sundays, cycle lanes turn into car parking lanes — legally or otherwise. At rush hour in the mornings and evenings it is common for taxis, buses and vans making deliveries to block the poor cycling facilities which are in place. If cycling was given dedicated and protected cycle paths on this route, could you image the potential? What if we built networks of segregated cycle routes across our towns and cities? People would use them for all sorts of trips and parents could be freed from acting as taxis for their teenagers. 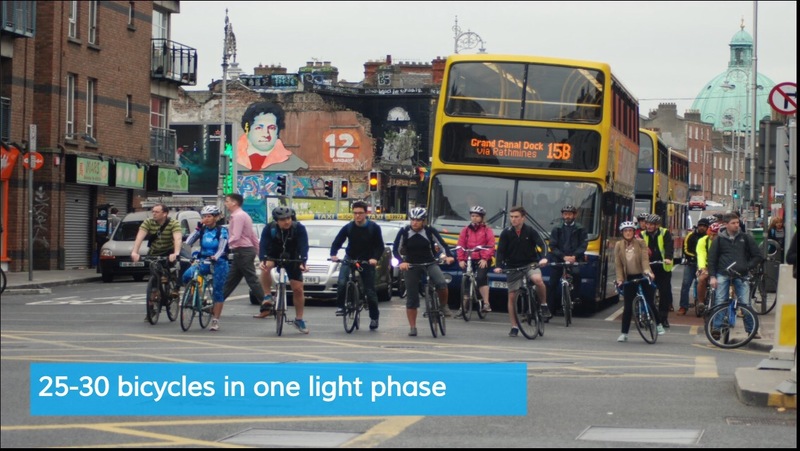 CSO travel survey data shows that the potential for cycling is strong: 66.2% of journeys in the Dublin area and 54.6% journeys in the rest of Ireland are under 8km — well within realistic cycling distances. Most of these trips are under 5km. Electric bicycles are expected to also increase the likely range many people would otherwise cycle. 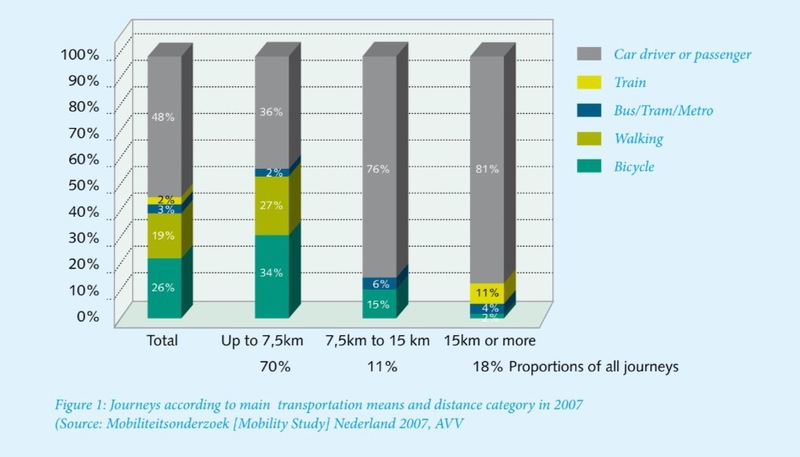 Public transport is also key for more sustainable transport. 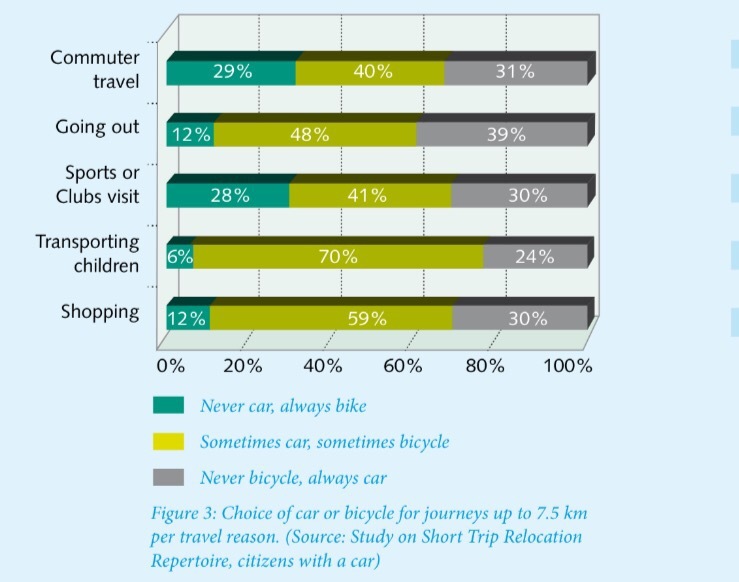 But we should not lose sight of the fact that cycling’s potential is a lot greater for more trips. Cycling goes door-to-door; there’s no timetable so no waiting around or cut-off point; in urban areas it’s often faster; and the cost is very low. And you can carry more on a bicycle with panniers and a basket or crate than on public transport — some Dutch experts call bicycles “shopping trollies on two wheels”. Cycling can also complement public transport, bringing people the “last mile” on bus or train trips. For local transport outside our cities, public transport has little hope in offering an alternative to car use. In towns, villages and in the rural areas around them, cycling actually has far more hope of filling the gap, at least for some people and certain trips. In towns especially, most car trips are short distances. But we should not expect most people to cycle in the current conditions. It’s unrealistic. For mass levels of cycling we need Dutch-like, high-quality cycle networks, ones which are inviting to children and teenagers as well as adults commuting to work. We repeat: networks, not a few good cycle routes. No Irish town or city has a cycling network even half comparable to the Netherlands — our cycle networks are still disjointed, have poor standards of surfaces, use poor designs such as shared footpaths, or use obstructive barriers. Building high-quality networks will cause disruption to the way things are now and it will cost a lot more than we currently spend on cycling. But with all the benefits it brings in emissions reductions (and benefits in unrelated areas), investment in cycling is well worth it. Will it happen? Brilliant article that should be required reading for all transport planners and politicians!….but please correct grammar issues first! Good to get this information out there Cian! A lot of wishful thinking out there about hybrids and e-vehicles on a par with diesel being a saviour! Only certainty for the moment is we have to stop burning fossil fuels. @ Colm – Thanks, grammar issues fixed. … So more Back to the Future iii than Back to the Fuure ii then! To be pedantic I should point out that Richmond St. doesn’t actually meet the scr at all! At that point Richmond St. Intersects with Harrington St. and Harcourt Rd.